by Janis, Richard R.; Tao, William K. Y. 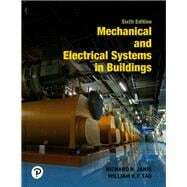 For courses in architectural drafting and design, and electrical and mechanical systems design. Mechanical and Electrical Systems in Buildings illuminates the modern realities of planning and constructing buildings with efficient, sustainable mechanical and electrical systems. This complete guide serves as a text and a reference for students and professionals interested in an interactive, multidisciplinary approach to the building process, which is necessary for sustainable design. Responding to continual advancements in the field, the 6th edition incorporates new developments in all its major disciplines, including electrical, lighting, telecommunications, plumbing, and HVAC.